New York Times bestselling novelist Nora Roberts captivates millions of fans with her provocative blend of scorching passion and chilling suspense. With Carnal Innocence, she creates a gripping tale of murder, infatuation, and true love in a small southern town. After beautiful concert violinist Caroline Waverly breaks up with her conductor and lover Luis, she escapes to her late grandmother's home in Innocence, Mississippi. Instead of peace and tranquility, however, she finds the town torn with suspicion over two brutal murders. When she discovers a third victim in the murky waters behind her house, she turns to her dangerously handsome neighbor, Tucker Longstreet, for protection. But Tucker has a reputation for breaking hearts-even worse, the police count him their number one suspect. 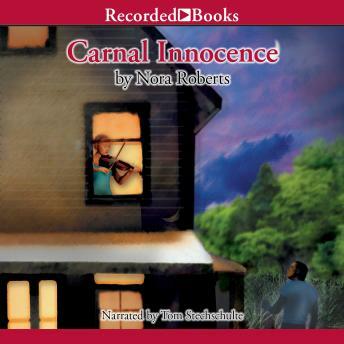 You'll want to lean back in your easy chair and let Nora Robert's steamy prose and Tom Stechschulte's stirring interpretation transport you to Innocence where the nights are filled with promise and secrets are hard to keep. This was a great story, Nora Roberts has out done herself with this one. It's a very good read that I didn't want to end! I loved the twists and turns in the book and the narrator did a great job of handling the accents as well! The narrative was excellent and needed to be that lazy drawl in order to complement the author's story. I didn't mind the slow build up as it set the scene beautifully to the dramatic ending. Sometimes humorous, sometimes sad, Nora Roberts has done herself proud. Couldn't get past the first 60 minutes of this one. Seemed ridiculously slow, and the first characters introduced had nothing compelling about them. I love a good Nora Roberts, but this one was not up to her usual level.